Substantial 5.2mm wide band, 1 carat fully set eternity ring, holding 1 carat of round brilliant cut diamonds within a channel setting. This fully set Diamond Wedding Ring can also serve the purpose of being a beautiful Eternity Ring. 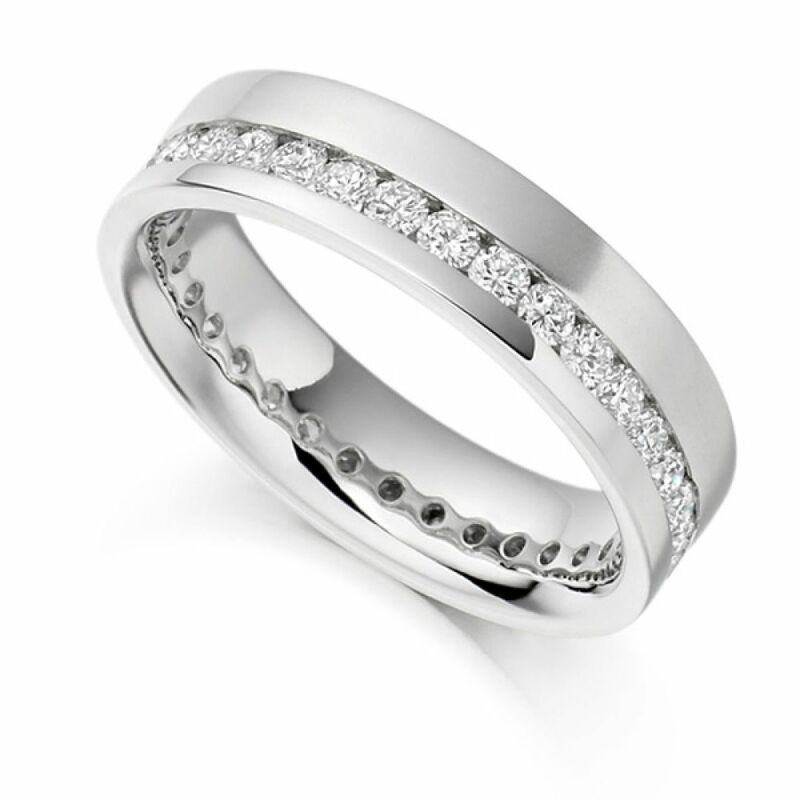 It features an offset channel of Round Brilliant cut Diamonds, giving it a contemporary feel. Each Diamond within your ring has been expertly graded F Colour and VS1 Clarity prior to being precision set into the band, and they achieve a total Diamond weight of 1ct across the whole ring. The band itself measures 5.2mm, making it both bold and beautiful. We can craft your ring in a number of different precious metal choices, including 18ct Rose Gold, 18ct White Gold, 18ct Yellow Gold, Palladium or Platinum. Please allow us approximately 3-4 weeks to craft your ring for you in your chosen precious metal. Your ring will then be delivered straight to your door by a secure courier, presented in our luxurious Serendipity Diamonds packaging. We offer a 60-day return policy and a lifetime of great client service once you have received your ring too.